Rental Villas in the Algarve, Portugal. We offer a very personal service, with an emphasis on quality. All of the properties are fully licensed and personally supervised by the Property Managers, who are on hand locally to provide assistance when required and to help make your holiday an enjoyable one! 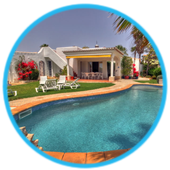 We offer a personally selected range of 2 to 6 bedroomed villas and apartments to rent in and around the beautiful coastal resort of Carvoeiro, in the Algarve. Most villas offer air conditioning and free wi-fi, some offer pool heating. We have been involved in property rentals since 1981, and offer a very personal service with emphasis on the quality of service we provide. A large proportion of all our bookings are from previous clients, a high proportion of the remainder are through recommendations and referrals - something we are very proud of. We have many clients from all over the world - British, Irish, Dutch, German, French, Spanish, Belgian, Scandinavian, Canadian, American, South African, Australian and of course Portuguese to name but a few. Our properties are very competitively priced, some have private pools, others have access to a shared pool. All of our properties come with maid service. 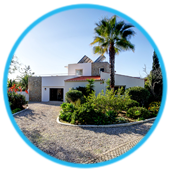 As well as offering a choice of accommodation, we can also assist with airport transfers to/from Faro airport, outside catering needs, rental of medical aids and much more. Further details on these are available from our office. If you require it, just ask! Please contact us for 2019 availability. With the unfortunate global problems, we are finding Carvoeiro and the Algarve becoming increasingly popular and peak time availability is already limited with us. Get in touch to reserve your summer holiday rental now.